The FrankenToyMobile is the proud and grateful awardee of a 2016 DCASE grant! This project is partially supported by an Individual Artist Program Grant from the City of Chicago Department of Cultural Affairs & Special Events, as well as a grant from the Illinois Arts Council, a state agency through federal funds provided by the National Endowment for the Arts. Learn more here. Democratizing creativity and building skills. That’s what we do! Check out this charming Newcity article by Krisann Rehbein to learn more about the FrankenToyMobile purpose and experience. Make a FrankenToy with the FrankenToyMobile! Check out our summer 2018 workshop schedule and invite us to your community. Even if you’re not in Chicago, you can see a workshop in action on YouTube. 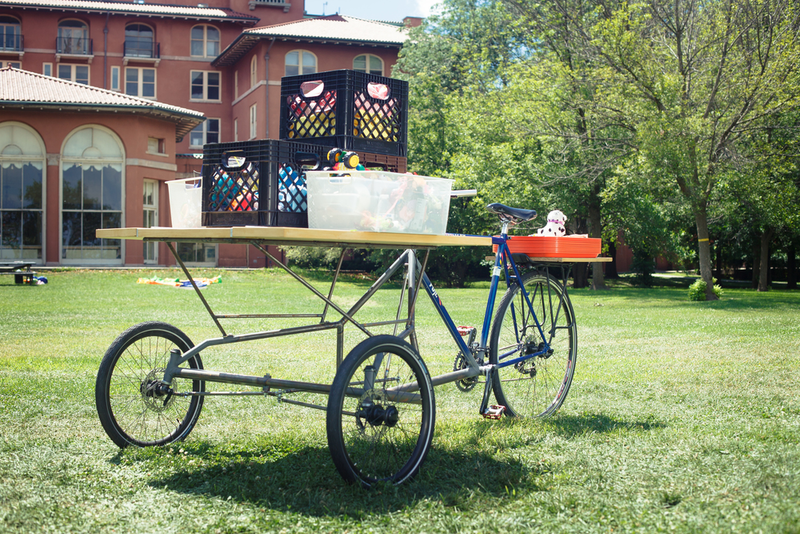 Launched in June 2015, the FrankenToyMobile is a pedal-powered maker space that encourages imagination and curiosity by providing free, hands-on workshops where youth and adults reuse toys as raw material for original creations. By inviting youth to modify “junk” toys into objects that they feel express their identity and personality, we encourage them to experiment, challenge dominant ideas about gendered toys, and see the world as being full of possibility. To date, we have served 4700 people through more than 90 workshops in public spaces around Chicago. The FrankenToyMobile was created by artists Andrés Lemus-Spont, Marya Spont-Lemus, Louis Fernandez, and Michael Pecirno. Learn more about the team and other contributors.